As regards both distance and accuracy, I haven’t much of a pitching arm, and so the discovery of a tennis-ball-on-a-rope dog toy has facilitated my playing fetch with my dog Joey. I hold the end of the rope, swing it pendulum-like beside me, and let it fly. Some physical law of thermo- or aerodynamics probably explains the magic. With the help of the rope, the distance I can throw the ball is greatly increased—as is the distance Joey runs and the amount of puppyish energy he expends. Life is good. There remains the matter of accuracy. Another law decrees that you have to get the right trajectory—that is, swing the ball in the correct plane and release it at the precise moment—or the ball-on-a-rope will disappear into the foliage of the nearest crepe myrtle. When that happens, your dog will still think you’re magic. After all, you made the ball vanish. But if you want to keep him using up his energy, you must be the retriever; you must make it reappear. Life goes off course. It leads to unexpected reversals. How many of my thrown balls-on-a-rope have gone amok, and how many cumulative hours have I have spent circling the crepe myrtle trying to spot where in the foliage the ball has gotten lodged? Though no one’s keeping statistics, the answer to both is “Lots!” Life is humbling. 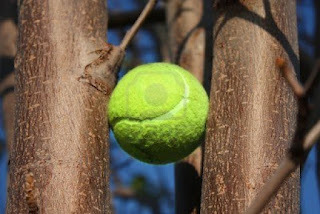 Once I locate the ball in the crepe myrtle, getting it down is sometimes easy. I shake a limb and it falls. Or I throw a shoe and, if I’m lucky (and if the shoe doesn’t get stuck in the branches too), the ball drops. But sometimes the ball has gotten caught in the higher branches with the rope—the very thing that makes it easier for me to throw the ball—entangled. Then I have to go to the shed to get a telescoping pole with a U-hook taped to the end. Sometimes I also need a stepladder. Life is complicated. I am writing about this in yet another week filled with grave news: Hurricane Isaac and the Gulf Coast; national political rhetoric that does nothing to solve our economic, social, and environmental problems; the Middle East. Plus I have friends in dire personal circumstances. You probably do too. Stroke. Cancer. Bankruptcy. Daunting, isn’t it? In spite of what my dog may think, I have no magic, and unlike the television evangelist who once claimed to have prayed away a hurricane headed for the coast of Virginia, my powers are not such that I can send storms or other hardships scuttling. Nevertheless, I do what you probably do. Pray. Deliver food or flowers. Make calls to members of Congress. Give to relief organizations and medical research facilities. And all the while wishing I could do more, prevent more, understand more, fix more. 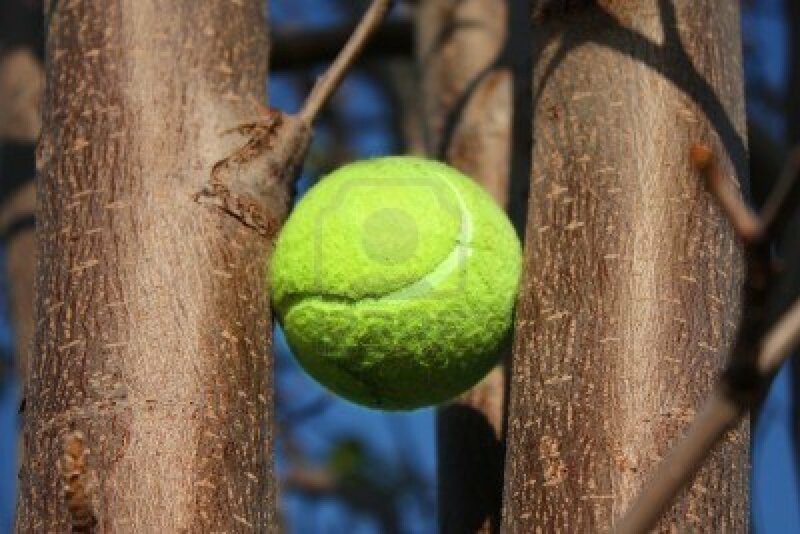 That’s where the tennis-ball-on-a-rope comes in. That’s when Joey and I go back outdoors to play. Sometimes the ball goes where I want, and sometimes it doesn’t. Sometimes he fetches it, and sometimes I do. Our activity has no major consequence for anyone or anything. It is nevertheless an act of living. Perhaps, in its own way, it is an also act of faithfulness—even a kind of prayer—for it reminds me that while life is painful, and daunting, and complicated, and humbling, and unpredictable, it is also good. Very good. And I am grateful for that. This is the time of year that lots of Nebraskans get a little weird because of their hopes for the football season. It really matters to us as a state how Big Red does. I’ll start with a brief, personal 49-year History of Husker Football. The coach I played for in 1963 maneuvered the Huskers to national prominence. His successor (an assistant) developed stability and excellence and achieved 3 national titles. One of my teammates (an assistant) valiantly tried to continue the tradition but experienced slippage and was removed as coach. An outsider was brought in from the NFL and attempted to remake the program but failed grandly. The current coach is guiding Huskers back on course but it will never be exactly the same as before. There are times during those five coaching eras when it seemed that the Huskers were as good as they ever could be. Even during mediocre seasons, some of the players were playing as well as any player ever could. Isn’t that how it is with the life of faith? Especially in the up-times we imagine there must be a way to bookmark what we’re doing and keep it like that always. But often, in the down-times, there are triumphs, and we have that solid feeling that with God’s help it can be done and that’s just fine. Many Husker fans desperately want the “Glory Years” back; but you can’t go back. Many Christians want their church or Christian experience restored to the way it was how they best remember it. Over the years I have heard the phrase “You can’t go home again”. Last spring in North Carolina, I learned the fascinating story (especially for English majors) about Thomas Wolfe’s background and why felt he couldn’t return to Ashville. Wolfe was advised by his mother not to return to Ashville because he named names in Look Homeward Angel. In many cases what he wrote wasn’t complimentary. Eight years later he was greeted as a celebrity and the people who were maddest at him were those not included in his book. His next title was You Can’t Go Home Again. There is wisdom embedded in that phrase. Don’t try to “go home again”; it’s different now. The Huskers of the 90’s were for that decade; successful Husker football won’t be a clone of the ‘90s. More importantly, who among us would limit God by hoping for the old thing, when God’s new best thing is waiting to become our reality. Summer is my season. My spirits soar, I feel physically strong, and my love of nature is fueled by a world of blue and green: blue skies, blue lakes, green forests and fields, and gardens of flowers. It is also my season for exploring. I love to spend my summer hiking, biking, running, kayaking, canoeing, and traveling to connect with nature. I was born in July and it always feels like I am reborn every summer. This summer I've had to approach it very differently. Multiple injuries are preventing me from walking, hiking, biking, and traveling. I've had to dig deep to find other ways to fuel my spirit. I’ve also had to adjust my identity. Friends, neighbors and family would describe me as very “physically active”. All too many have said to me….you must be going crazy not being able to walk, hike, run and bike. Faced with this question, I’ve realized I need to let my core shine through more. I want people to know me as a woman of grace, kindness and resilience. My journey the last six months has been to find the words, actions and ways of being that is not physically active but more of a “soulfully active person”. This discipline of self-reflection and personal resilience has been driven by a decision to make this my summer of grace. Grace has so many definitions but for this summer, three elements have been revealed. 1. Grace in Spirit- Grace in spirit is being gentle with myself and trusting that the unknown of multiple physical challenges does not mean I have a challenged spirit. Infact, it has been an opportunity to deepen my connection with my inner light. 2. Grace in Engagement- Kindness to others, generosity of time and conversation, and listening deeply are gifts I can offer to others during this time. My willingness to be open to deeper conversations has created a summer where my friends and I have had deeper connections. We have been more honest, more real, and more spirit led. 3. Grace in Reflection- Because of my limitations, I spend more time alone. I’ve always been comfortable by myself but this year while others are on vacation or off hiking and biking, I have learned to be still with myself. I’ve learned to savor this quiet as a time for reflection and finding grace from God, grace from life, and grace from all that touches me. I remember one day recently when I was watering my butterfly garden at the quiet end of the day. 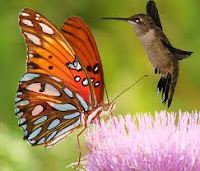 I was splashing the faces of my flowers when a butterfly and hummingbird decided to play in the water spray. They flew in and out of the water and around my head as if I was part of the garden. I stood so still so they would play and refresh in the water and keep dancing around my body. As they started to wander further from the water, a friend drove up my driveway. I had a beaming smile on my face and said…”you won’t believe what just happened to me”. After telling the story, her response was…”they must know you are the one who’s created this beautiful garden”. At that moment, I realized I had figured out how to fill my spirit this summer. By focusing on grace, I had created a garden where my soul could thrive. I hope to walk, hike and travel again some day but what I hope most of all is that I will view myself as “grace active”, not just physically active. I hope that friends, family and colleagues will also see that I am truly grace active and grace centered. Polly is the Chair of the Management Department for Antioch-NE Graduate School. "It is my honor to serve our students, faculty, staff and alumni. 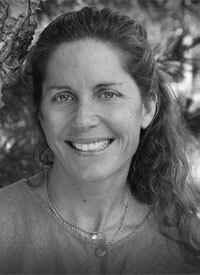 In this role I bring together my skills and experiences as an environmental educator, scientist, teacher, administrator, consultant, and systems thinker." For more on Polly, click here.